The Truckee Tahoe Airport is a community airport that provides high quality aviation facilities and services to meet local needs, and strives for low impact on our neighbors while enhancing the benefit to the community-at-large. MARK YOUR CALENDARS FOR KTRK's 2019 AIR SHOW! TOWER/CTAF: 120.575 Mhz / AWOS: 118.0 Mhz / UNICOM-FBO: 122.95 Mhz / GROUND: 118.3 *when Tower is in operation / Oakland Center: 127.95 Mhz. A joint KTRK and FAA Airport Improvement Project (AIP). 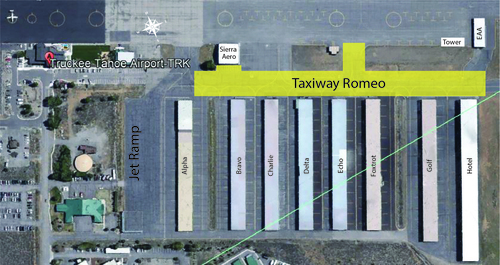 As many of you are aware, Taxiway Romeo (the taxiway on the immediate north side of hangar rows Alpha–Hotel) is a bumpy ride and in much need of repair. To that end, the District was successful in securing an FAA grant for $1,981,723 to replace the utilities and repave all of Taxiway Romeo. ➤ Click for more construction information and timelines. Since 1958, the Truckee Tahoe Airport District has been providing a high quality, safe facility for pilots, visitors and the community. Nestled in the Sierra Nevada mountain range at an elevation of 5,900 feet, twelve miles from Lake Tahoe, we promise one of the most scenic flight and visiting experiences in the world. We are proud of our pilot safety and community programs, state-of-art energy saving facilities and top notch staff and leadership. We are committed to offering the best small, mountain airport in the Country.